You know those days when you have great plans but you wake up and want to vomit? Aren’t those just the best? The moral of the story here is that you don’t want to take extreme doses of Advil on an empty stomach, or else. Also to note, is that usually Monday around here is recipe day but I don’t know if you all still want me to do those. I mean, I will, but you gotta let me know. I’m not sure if there is anything better than a simple black shift dress with a great necklace. Actually, I am sure and there isn’t. So there. This necklace is perfect. The right amount of sparkle and still so neutral and wearable. 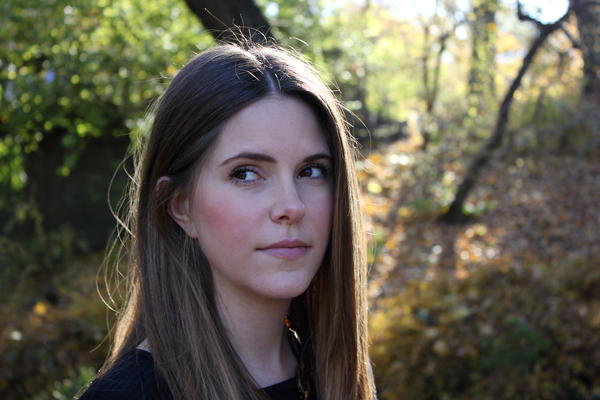 What blog post is complete without a paparazzi shot? None. You’re welcome. Happy Monday! BABE. And please keep the recipe posts coming. I need someone to tell me what to cook/bake. Love this dress! And the dose of sparkle! 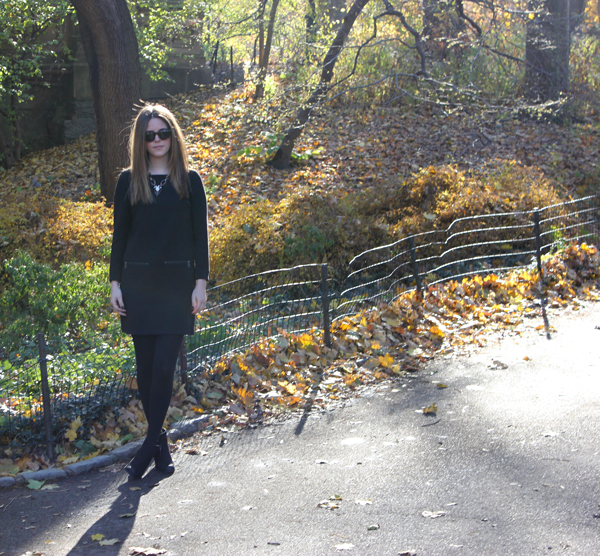 There’s nothing better than an easy LBD to throw on any time. You look so pretty! Absolutely love the necklace – and the outfit in general. And keep up the recipe posts – you’re so good at taking baked treats from the “that looks yummy” to the “oh-my-god-I-must-have-this-now” level! Yes to the recipes, and yes to the dress. In a non-marital way. Although, if you had to marry a piece of clothing, an LBD would be a pretty safe choice. What a babe! Love this dress on you! That dress is clutch and I agree with the statement necklace- you could wear that gem with anything. I love all your recipes, keep ’em comin. Love this – simple and awesome. Really all black is the best ever. Love it! That dress loos so comfy but dressy at the same time. Gorgeous you! you look great! my go-to outfit on days when i don’t feel good is a cute dress and awesome necklace. also, yes please on the food. always yes to food. The all-black looks fab! 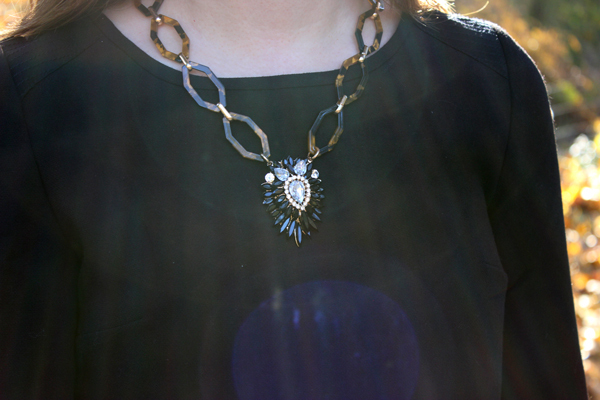 Also, “statement necklaces” are my favorite. love this outfit! gorgeous dress! I just love the way you write things so matter-of-fact (ly). Also, great outfit! I wear a lot of dresses to work and people are all ‘you’re so dressed up’ and I’m all “yeah this dress took half the time to put on than building an outfit’. great photos, blog and dress! You are rocking my favorite color!! Love that pap shot.